I had today (Friday) off, so I hopped on my Yamaha XT-250 and headed for the high country. I took the road from Ouray to Engineer Pass. Whew! But I’m not sure what got more of a workout: the motorcycle or the camera! The view from Oh! Point. You're not in the mountains at his point. You're on top of them! Click on image for a larger view. First, a few words about the road. This is not, repeat not, a road for a beginning off-roader. In fact, I’d rate it at least high intermediate. There are boulder fields to cross, tight ascending and descending turns, serious erosion, and much more. 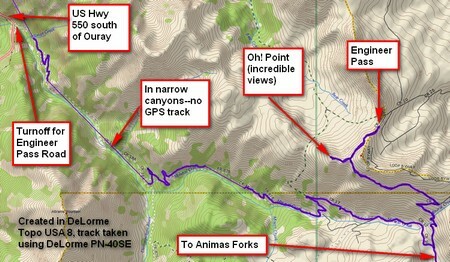 Here's the GPS track for the trip from Ouray up to Engineer Pass. The steep, narrow canyons prevented the GPS from getting all of the track. Okay, let’s walk through the road. Head south on US Hwy 550. This takes you into a very steep canyon. As you round a corner, you’ll see a rather wide-mouthed dirt road heading east. This is the road you want, and the wide part is so that people with 4-wheelers and non-street-legal motorcycles can park their pickups and trailers. Unlicensed vehicles are not allowed on paved roads in Ouray County. The road is marked as both four-wheel drive and high clearance. Note the high clearance part. This is not a road for your Blazer or Explorer. You can easily rent a Jeep in Ouray for $150-$200/day. Last year I encountered an idiot trying the road in a Subaru. When I came back the same way an hour or so later, the vehicle had been abandoned (right on the road) with a note saying the clutch was burned out. Back to motorcycling. By and large, this is a first gear ride. You’ve got to go fast enough to keep the bike upright, say 8 mph or so. Don’t let it stall! You will encounter a very rough road surface (the term “road” here is stretching things a bit) with large embedded rocks (a foot high or so). Personally, I prefer going over the embedded rocks rather than finding a path around because usually the other path is full of scree (loose rock). Sometimes there is no way around the scree. Take your time but keep going. Stand up! Look way ahead, not down at your feet. By the way, this road has some serious drop-offs, so you don’t want to wander off the road. The road gets easier as you go up—toward the top prior to the turnoff I used second gear a little bit. But beware the road can suddenly become very steep. There are numerous ascending hairpin turns, often filled with scree. Use your best technique! Oh—those steep ascending turns become steep descending turns on the way back! As I came back down from the pass, there was one steeply descending hairpin that had lots of mud in it. Fortunately the turn had a bit of a run-out. I opted to use this, stopping on the run out, turning around, then heading straight across the mud rather than trying to turn in it. This view looks down on some switchbacks you have to climb. As you take the turn up toward the pass proper (the other way goes down into Animas Forks), you’ll find the road is severely eroded by fast-flowing runoff. I could pick out a path, often crossing puddles, without too much problem—again, look ahead, not down! But there were places where I wondered how a four-wheeled vehicle could get through! The views are incredible. Everything’s green (and wet) right now. As you can see from the pictures, there’s still lots of snow here and there. I took many pictures from Oh! Point. Once reaching the pass proper, I put my camera down in the rocks and took a self-portrait. This is what's at Engineer Pass itself. The views are good but not as good as at Oh! Point. The road going down Engineer Pass to the east will lead you to Lake City, where you can loop around and come back over Cinnamon Pass. But part of that loop is paved, so you’ll need a street-legal vehicle. My experience last year says the road down to Lake City is nowhere near as difficult as the road I traveled today, but that was last year. I opted to turn around, go back down, and take the road to Animas Forks.